Everyone talks about Apple innovation and how they are great designers and creators. They have come up with some amazing ideas; marketing ideas. If you look at the history of Apple they have really not “created” much. They have taken ideas and concepts and made them work and in some cases even made them better, but for the most part they have not really created anything new. For those that are going to nay-say this let’s look at a few items. The original Apple, was based off of concepts that were seen at Xerox and also on the IBM “PC” concept that was out. The Original iPad was taken (as proved in court) from the Creative Nomad MP3 player. The iPod was a much better product, but it was based on the Creative design. You can look back and see this trend in almost all of Apple’s devices. I am not calling apple out on anything new here as this is also the trend with most companies. Where Apple does things different though is to file a patent on their way of doing things and make those patents so vague and broad that they can easily be extended to encompass almost anything in the event that Apple feels threatened. 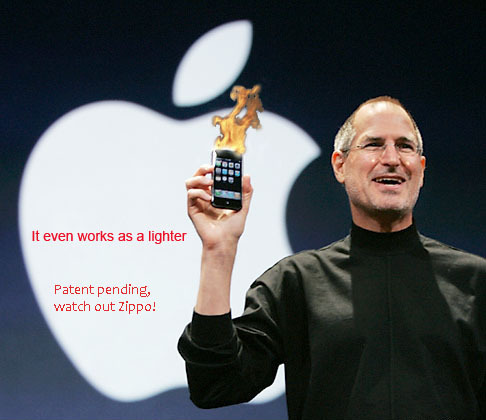 A case in point on this is one of the core patents in the Apple Vs the world of Android suits around the world. The Patent that was granted by to Apple actually covers “the look and feel” of the way a touch screen works. Excuse me? The look and feel? How to you patent that? Maybe I am wrong, but I thought patents were for technology. As such they should be about the actual hardware and workings involved not the concept or thought. Still Apple has managed to push these through even with prior art in evidence and on the books. So Apple’s success (and bank roll) comes from being able to market old ideas as new and innovative, and to patent concepts and ideas that are so broad that they can sue anyone that even tries to invent a competitive product. Considering they are getting away with it on a massive scale it is really not a bad business model.